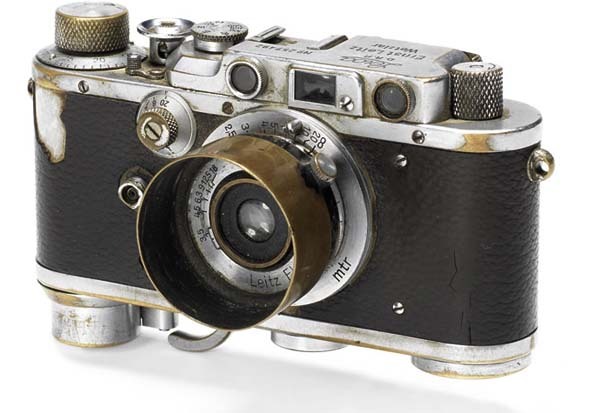 The camera used to take an iconic image that came to symbolize the Russian victory over Nazi Germany is to go on sale at auction this November in Hong Kong. Photographer Yevgeni Khaldei, who worked for the Soviet news agency TASS, shot the image of Russian soldiers waving the Hammer and Sickle flag from the top of the Reichstag using a Leica III, sometime after the building had been captured. The camera, bearing the serial number 257492 is accompanied by an Elmar f/3.5 50mm lens with the serial number 471366 and is set to be auctioned on 30th November. Auctioneers Bonhams has set a guide price of $HK 3,000,000-4.500,000 (equivalent to £230,000-340,000 or $390,000-580,000). This entry was posted in Collectible Leicas, Documentary Photography, Famous Leica Users, Film photography, Leica Film camera, Leica Photographers and tagged collectible leicas, Leica III, Yevgeni Khaldei on October 12, 2014 by Leicaphila.